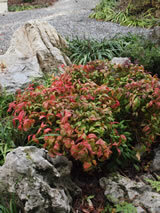 Decorative bamboo-like shrub forming a rounded compact bush. 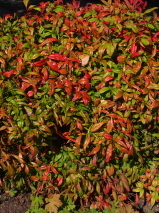 Leaves lime-green at first turning to purple, crimson, orange or scarlet with the seasons. Colour best in the sun. Hardy for most sites. Easy care. Prefers a sunny site / Will tolerate very hard frosts.